Songs of freedom fill the air when you enter Freedom Park. This heritage site on the Salvokop hill in Pretoria is a symbol of the struggle for humanity and freedom. It is also a spiritual place for healing and cleansing of the spirits of people who fought for freedom. But it does not only focus on the struggle against apartheid, it also tells the story of South Africa’s history and culture from long ago until today. 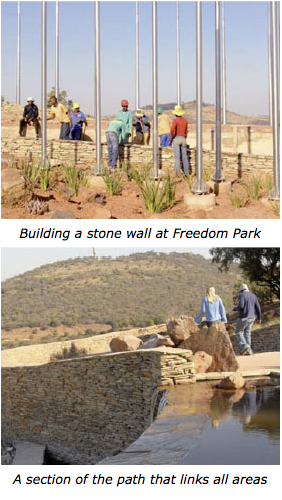 From Freedom Park you have a beautiful view of Pretoria and the areas around it. One of the most striking things about the site is the walls and paths made of carved stones from Limpopo. The stone walls show the names of people who died during the country’s different periods of conflict. These include times of slavery, wars of resistance, the Anglo Boer wars, the first and second world wars and the struggle for liberation from apartheid. Each area of the park has a special meaning and represents a different part of the country’s history. All our languages and cultures are also represented like, for example, in the names of the areas. The park is open to the public and is ideal for school tours, business functions, tourists, family picnics and cleansing ceremonies. Some areas are still being built, but everything will be completed by 2009. Isivavane represents the resting place of the spirits of those who gave their lives in the struggle for freedom. Sikhumbuto commemorates the main periods of conflict in South Africa’s history. Tiva is a still body of water where peace and calmness is felt. 3,6 billion years is showed with pictures and sound. 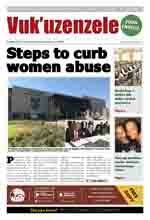 The Pan African Archives is where the country’s history is stored in computers for the public. Moshate is the place where people can get together and talk. Uitspanplek, which means resting place in Afrikaans, is an area where the whole family can spend the day relaxing. 2 000 people. It is ideal for festivals and outdoor activities.